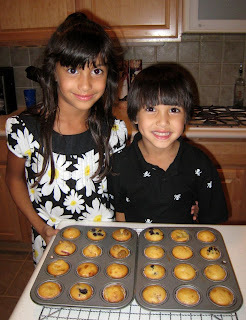 BentoLunch.net - What's for lunch at our house: Muffin Tin Monday - It's-a-Muffin Theme! 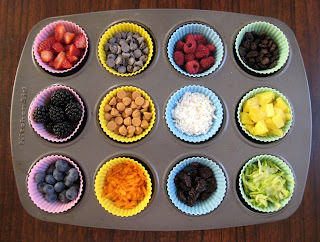 Muffin Tin Monday - It's-a-Muffin Theme! OK, now back to muffin tins! One of my readers (Yiran) mentioned idea this over on my personal blog and I told her I was going to borrow it, because it was perfect for F&B! 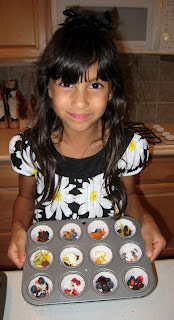 We had Muffin Tin Monday Make Your Own Muffin Tins! 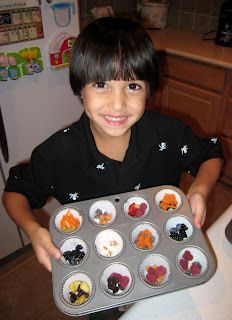 I set out a tray of all sorts of muffin fillers, whipped up a batch of my mom's perfect base muffin mix, gave F&B each a mini muffin tray and wrappers, and they made a tray of their own muffins in all sorts of combinations! The kids loved making their own combinations and there was a lot of discussion about "Do you think this goes with this?" and "Will this & this taste good?" and "What else would you put with this?" This was probably one of our more fun projects lately. They had a blast (and ate a whole bunch of the filler in the process). Each of their trays after being filled. I just poured the batter over top of each filled cup. And two trays of muffins! I color coded the wrappers, of course. I'd rather not hear about it later on. 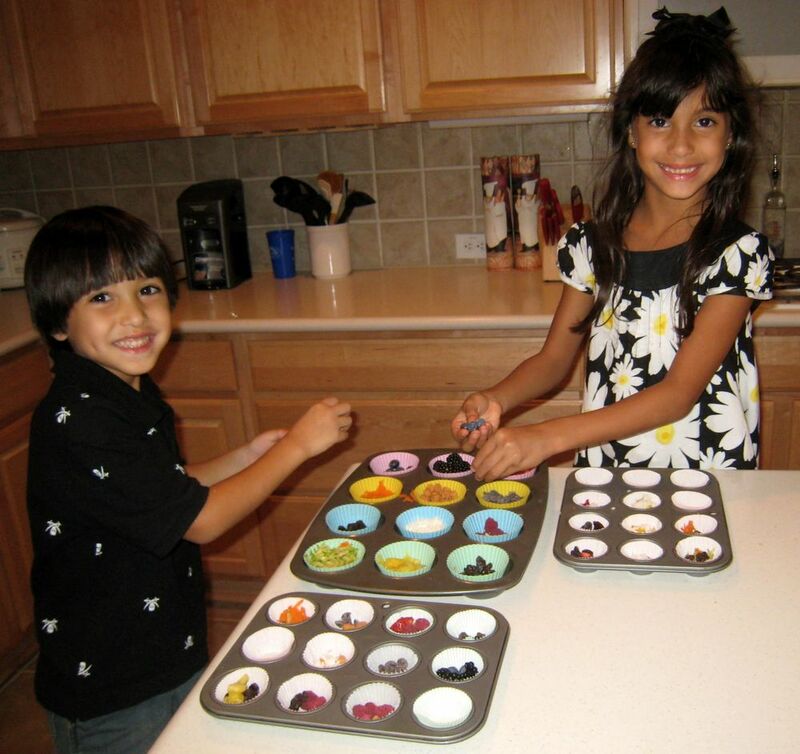 What a great post and your kids are adorable! 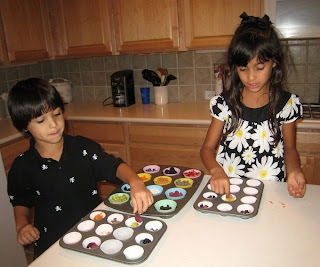 I love photos, love the creativity that this inspires, and always the good mom thinking ahead with the color coding. Of course I only have one child so that's no problem here, but I remember names on things when I was a kid! What a great idea! My daughter loved putting a blueberry on some muffins we made recently (I didn't restrict her to 1 berry per muffin. It's just what she did.) And she loved spooning the crumble on top after! She's only 2, so she might not understand the concept of this, but it would be fun to try! Thanks! Love this idea and I'll be sure to use it when my kids are a little older ... if I remember! I have to say, your children are just georgous. If they were the same height, I'd sweat they were twins too. It's the eyes! Making muffin is an awesome idea. They looks wonderful. It looks like they had a great time creating them. I love the idea of allowing the children muffin filling choices to engage them. Lots of fiber, and a little chocolate how could you go wrong. What a lovely idea!! Not sure if my little one is too young for this yet... but will maybe give it a go. It's my first week of MTM and I'm so excited! Brilliant!!! I am so copying this fabulous idea! what a neat idea! something fun for a weekend - may try this - thanks! great idea - I'm going to do that with my girls today! Superb idea - Will be doing this with my boys very soon, after I get the "fillers" ingredients in. I never knew you could just pour the batter over like that! this is so awesome! I really want to try this with Ransom! What is the muffin filler that you use? Do you make it from a Bisquick or something similar? Or something else? Please forgive my stupid questions, I've never made muffins before. lol. Wonderful ideas! New follower here! Thanks everyone! We are definitely going to do this again. My freezer is always full of the last 3 or 4 muffins in a batch b/c we're all tired of them, these are all a little different! for the batter. It's my mom's recipe and I use it as a base for all sorts of things. I adore this idea. We will be borrowing it as well. That is such a good idea! One that will HAVE to borrow! !